The Penna. National Guard having a camp in Milmont in July of 1893. The third day of camp George Lawton dawned bright and clears yesterday. The boys awoke with the sun, but did not arise for some time although the sound of the first call brought them to their feet with a jump. Night clothes were discarded and the campus was soon swarmed with the young soldiers ready for breakfast. The regular morning drill at 9 o’clock was omitted yesterday and that gave the boys more time to look around and find out some of the places to spend the time off from drills and the entertainment of their friends who come out to camp each day to see them. They soon found a place and went into bathe in Crum Creek, staying for some hours. The usual mess call took them to their dinner and after this the pranks of the day started. The camp menu is substantial, consisting of corn, beans, potatoes, rolls, bread and butter, and watermelon for desert. On this the boys are getting fat, and with the little side dishes sent daily from home they will be able to last until the last of the week. An Italian ice cream vendor wandered into camp in the afternoon and while he sold the cream he had in stock, he had some trouble getting out with himself and the team. The boys purchased the delicacy in great quantities, and while the vendor was taking it to the different tents, some of the guards unhitched the horse and hitched it the wrong way about in the vehicle. There was a storm of words but the boys did not understand what the man said so that is all it amounted to. The harness was turned about so as to represent cart harness, and the hitching gearing was turned back to the harness in such a manner that the horse would have gone backward, even though he was going forward. This, with many other little pranks constituted the days fun making, and the sober side of camp asserted itself when the evening drill and dress parade hour arrived. A new drill known in army circles as the extended order was for the first time gone through with a very creditable manner, and the Lieut. complimented the boys on the good showing they made. This will now be the regular order for the 4 o’clock drill. A good joke is told on the Lieut. In fact, he tells it himself so that there will be no harm in repeating it. The boys have had bread but some of them wanted rolls. Accordingly they got their heads together and one suggested that a good time to let the commanding officer know their wants would be when he was half asleep. The suggestion was immediately carried out and the Lieut. said yawningly, “Oh, yes; get the rolls.” In the morning early there were five dozen rolls in camp, and the lieutenant was inquiring from whence they came and he is yet trying to remember when he gave the order. The first newspaper man to stay at camp over night was Robert Fuller of this journal and he slept with the boys all Monday night, but the funny part of it was that he also is the first newspaper man ever heard of who refused a meal and this Fuller actually did, leaving the camp grounds very early in the morning. In camp are, Lieut. J. A. Fields; Lieut. R. Anthony; lst Sgt. W. Groening; 2nd D. Chambers; 3rd Sgt. R. Haydock; 4th J. Gilmore; Col. Sgt. C. Shreve; 5th Sgt. R. Fields; Corporals Haydock, Bald Anthony and Keyes; Lance Corp. E. Mifflin; Bugler, C. Williams, H. Williams; Drummers, Neill and Fields; Privates, Atherholt, Armstrong, Bentley, Black, Batty, Conley, Combs, Deakyne, Givens, F. Harrison, J. Harrison, Haldt, Snider, Sterling and West and Com. Sgt. R. Morris. The cook is Richard Danby of Co. C. 6th Regiment, N. G. P. and he is assisted by Cassidy Cook. This evening headed by Lieut. Fields the boys will march to the Leiper Presbyterian Church where they will enjoy the concert to be given for the benefit of that edifice. The boys have been invited to the church by Miss Eliza Leiper the Sunday school superintendent and they gratefully accepted the invitation because it will help the cause along and break the monotony of the camp for a little while. J. C. Neill presented the guard with the handsome camp emblem the stars and stripes which floated from a pole at the entrance to the company street. Tomorrow evening the guard will give a watermelon party to their families and friends and all are extended a cordial invitation to be present. Mr. Buchanan sent out a basket of peaches which are relished after the drill. There has been no sickness to speak of and the boys will be well looked after by the commander who says that nothing will be done to mar the pleasure but they must not commit any indiscretion. The pictures of the camp and of the guard on drill were taken yesterday by Mr. Neill also photographer Green of Chester. Many visitors were in camp last night. The visitors to the camp yesterday afternoon included; P. M. Driver, who brought some delicacies as he always has a warm spot for the boys. Robert Napier of Ridley Park was also seen on the grounds chatting with the boys. Claude Conway an ex-member of the guard spent the night in camp. Mr. Neill took supper with the boys last evening and states that they will not starve on the feet doled out. Tracey Waller and Mr. Caskey both of the Park looked the boys over yesterday. 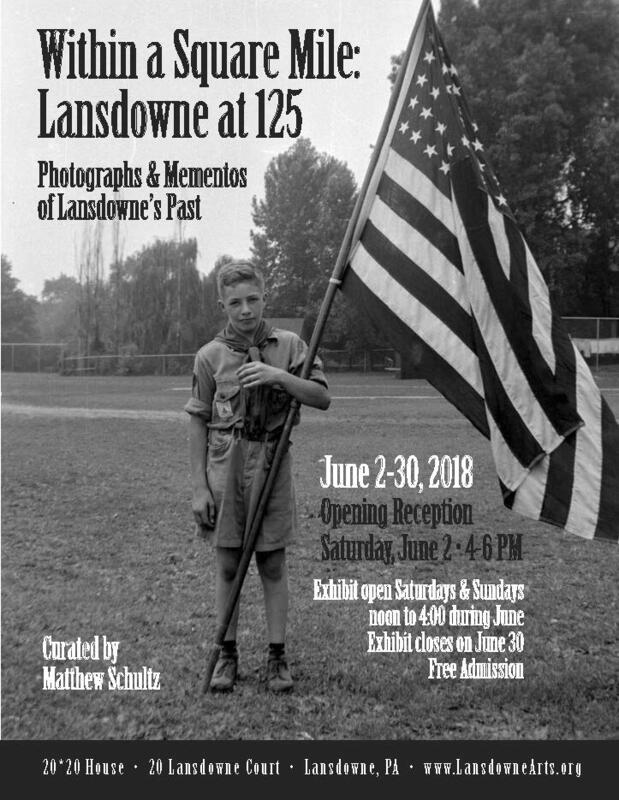 But forty-eight hours more and camp George Lawton which has been the source of enjoyment for the boys of the Ridley Park Local Guard will be no more; but many pleasant memories will remind them of the pretty slope of the hill upon where Camp Lawton stood. The boys are making good use of their time and some of them are already beginning to sign because of the nearness to the close. The usual crowds of visitors are still daily pouring into the camp, and Lieut. Fields and Anthony are kept busy showing them through the quarters. Many of the visitors are the parents of the boys anxious of course, to know how comfortable they are situated and all have but one word of commendation for the gallant young officer of the 6th Regiment who has the camp in charge. Yesterday the usual pranks of the camp were indulged in, with several additional ones, and night time the lads were all ready for a good sound sleep. The blanket came into play several times during the day and many got a merry ride. The paddles also came into good service for certain ones. 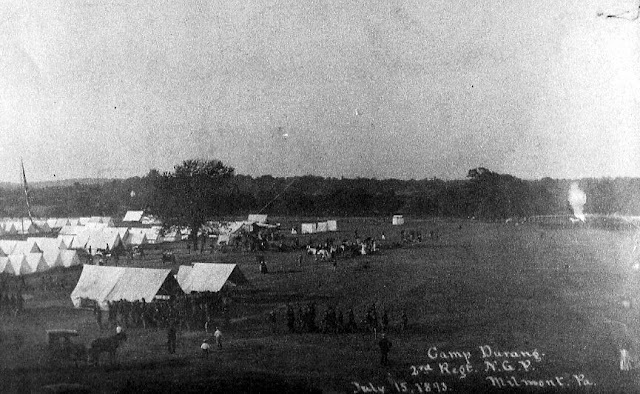 Camp will break tomorrow at 11 o’clock A. M. and the boys will take up the dusty march homeward, arriving at the park at noon. The tents will not be taken down until 6:30 P.M. and this will be left for the guard detailed for the work. Last evening the watermelon party was held at camp. After the mess was all over and cleared up the melons were disposed of in great shape amidst the shouts and laughter of the many visitors, who were the parents and friends of the Guard members. The big mess tent was full and it was long after the shades of night had fallen that the merriment ceased and good nights were said. Many of the party who had visited the camp then for the first time were sorry they had not been out before. Those present at the watermelon party were: Mr. & Mrs. Fields, Mr. & Mrs. Anthony, Mr. & Mrs. Groening, Mr. & Mrs. Chambers, Miss Groening, Mr. & Mrs. Haydock, Mr. & Mrs. Sreve, Maj. J. C. Gilmore, Mr. & Mrs. Bald, Mr. & Miss Keyes, Mr. & Mrs. Hance, and the families of Messer's. Neill, Williams, Armstrong, Atherholt, Bentley, Batty, Conley, Combs, Deakyne, Harrison, and Haldt. Rastus caught a chicken. Said he did not mean to hit it Denby chased Rastus all over the camp. Something that smelled like chicken broiling ensued. When the boys awoke too they sniffed the air. The mess tent was entered by Lieut. Fields in the lead. A dive was made for the table and that poor chicken was in just two seconds, no more. Lieut. Fields heaved a big sigh but asked no questions. Rastus, was without speech, vindicated. Someone, of course, no one knows who, let the tent down on Tuesday night and then there was some sound loud talk and threats but that camp gang was at work and it will never perhaps be known how it happened. Two baskets of cantaloupes appeared in camp yesterday. Where they came from, nobody seems to know. Some of these boys will be all to the good if they ever go to war. There is one thing sure they will never go hungry. Sgt. Williams has been promoted to the new rank of Sgt. William is a good burglar. Commissary Ralph Morris is a good fellow and has the thanks of the entire command. A solder (?) guarded the watermelon yesterday. They might have walked away. Some newspaper correspondents who gets into camp have said that there were no newspaper like theirs. We have not noticed their glowing accounts of this trim little camp. Why? Because like in other things, the Morning Republican leads. The boys look for the paper eagerly each morning and they get the news. Mrs. Shreve of the Park was entertained yesterday by her son who is a member of the Guard. Mr. & Mrs. V. A. Caskey & Son and “Dewey” were in camp yesterday. Fred Driver, Fred Duvall, Wm. Edwards and Tracey Waller spent Tuesday night in camp and enjoyed the outing. Miss Martha Pomeroy of the Park enjoyed an evening in camp on Tuesday. Miss Rider drove over from her home and inspected the camp on Tuesday evening. Stewart Keyes and Warren Tyson were also among the visitors from the Park. Captain A Y. Davison of the Morton-Rutledge artillery Battalion reviewed the dress parade last evening. Adj. Smith of Morton was in the grounds for some time last evening? A soldier came straggling into Ridley Park shortly before the noon hour yesterday and soon he was followed by others, and still others dust begrimed and tired until about twenty of the little fellows had sought for the first time for a week, the shelter of their own homes. They were all happy, too, but a little bit discontented because one of the most enjoyable weeks they had had this season was at an end. Camp Lawton was no more. Camp broke at 6:30 o’clock in the morning after one of the most enjoyable nights under canvas since the boys have been on the crest of the hill about the Ridley. Everything went and during the night no one was allowed to sleep. All were ever on the alert for a sleeping one and when one tried to catch a catnap, it was not long before a discovery meant a blackened face or a pull from quarters by the heels and sooner than submit to these little outrages the boys stayed awake and one after the other, fell in with the camp “gang” until the whole camp was awake and up and doing. The last day in camp was like its predecessors was one of enjoyment not only for the boys but for a great number of visitors who came from all directions to spend the last few hours with them. Lieut. F. Fields and his assistant, Lieut. Anthony was kept busy during the entire day entertaining friends and they did it in a manner becoming to the dignity of Camp Lawton. It was intended at first to march back to the Park in a body but taking down of the tents and getting the boxes to their various destination took too many of the boys and as the balance left was only a baker’s dozen. The lieutenant decided not to march with only a handful. Everything was done during the night to have a good time and the boys will long remember the last night spent in camp and look forward to the next one which will be one year hence. As of Thursday and some of yesterday morning was given over to the cleaning of arms as the commandant gave the orders to appear at next drill with shining arms. “What am I going to do now?” asked little Rastus as the boys left camp. “They are all gone and nothing is left but me and the dog.” Rastus, however, will go back to Chester to his home and should he ever visit the Park the boys will give him a royal welcome. Rastus was responsible for the only chicken the boys had the pleasure of eating while in camp. A newspaper man who stayed in camp overnight awoke in the morning with a blackened face, but nothing was said because no one knows better how to take a joke than a newspaper man. Three cheers for the Morning Republican, three cheers for Lieut. Fields and hurrah for everybody and everything connected with the camp was the parting greeting the boys gave. At noon yesterday the field did not look as if it had been inhabited for a week by as jolly a set as ever visited Fairview. It is all over and may all live to enjoy the healthful breezes wafted over the crest of the hill at Fairview one year hence.